A word like “big” in a title can become a big deal. The Big Sleep, 1946; The Big Hurt, 1959; The Big Valley, 1965; The Big Chill, 1983 and in 1998, a really humongous biggie called, The Big Lebowski. Kumail Nanjiani, the Pakistani-born comedian (HBO's Silicon Valley), plays himself in a script he's written with his wife Emily V. Gordon. I didn't do deep research into the possibility that this movie may have autobiographical elements in it, since Zoe Kazan (whose grandfather's first name is Elia) plays Kumail's love interest in The Big Sick. Hint: Zoe's character's name is also Emily. Oh yes, Emily (of the film) has two parents: Beth, that's Holly Hunter and Terry, that's Ray Romano. I've always been a large fan of Hunter's; not so much Mr. Romano. It's not that I don't think Ray has talent or that he isn't funny for lots of people; I simply have a problem with Ray's voice. When I hear him speak in long passages, I always find myself needing to clear my throat. Humail and Emily meet and are locked in quick attraction. He has brown skin. She has skin that's white. This is much of what this film is about, and the solid messaging ingredient for The Big Sick. Humail's family is rather conservative; much more so than Humail, but they're great people who have brought their religion to America. The Nanjiani family is working toward arranging a nice marriage for Kumail. He's just not going for it, even though the young Pakistani women “happen to drop by” the Nanjiani home at dinnertime are well-mannered and lovely to look at. But wait, the film gets serious: Emily contracts a lung infection that brings on a very big sick. She's in rather critical condition and hospitalized. 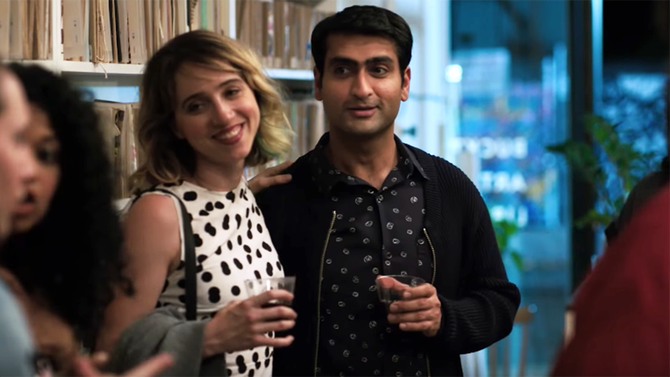 Ms. Kazan is quite pretty and fetching, even when she's in an induced coma in a hospital bed with her parents and Kumail hovering ... while Beth and Terry are also wanting to know: who IS this GUY? so intent on being here with our sick daughter. Yes, what wehave here is: a failure to get a meshing of cultures … not to mention Beth's super bad attitude. It's a kind of a predictable movie, but entertaining, if you're a fan of Mr. Nanjiani's brand of low-key, droll humor that I avoid when Silcon Valley appears on my Samsung. His stand ups depicted in The Big Sick have been purposely scripted to be lame; I can go with that; they are. But I still don't think THAT'S funny as most others in the theater seemed to think. Maybe it's just me. A tip: if you want to see a good turn a bit different about a stand up character trying to make it in that tough category of show biz, see Apatow's Crashing when HBO places it into unending, revolving repeats like all those movies that have. Guests in it are the stand up comedians, playing themselves, trying to help the fledgling comic hero, Pete (Pete Holmes), a former Christian pastor, survive to success as a comedian after being abandoned by his kooky, sleep-around wife. Holy Punchline, Sarah Silverman and Gina Gershon even show up and give Pete a hand. Copyright©2017 by G. Chew. All rights reserved. No Comment to " Chew's Reviews - The Big Sick "